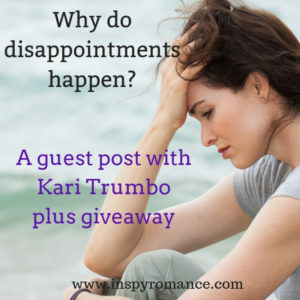 Guest Post with Kari Trumbo: Why Do Disappointments Happen? Good day, Inspy Romance readers! I’m so happy to be with you today. Alexa Verde kindly messaged me with an invitation to talk to you, and I’m so thankful she did! Have you ever had one of those days where the water you’re pouring into the coffee pot spills everywhere, or you get an unexpected call of the unpleasant kind? Recently, I was looking at my bank account and found that someone had taken my identity (along with one of my credit card numbers) and signed me up for all sorts of subscriptions. I was so angry, frustrated, and even hurt. I had to take a step back. Sometimes we are disappointed, discouraged, frustrated, and on and on. We are human. We are equipped with these feelings by a patient and understanding God and it’s okay to feel them. But it doesn’t feel okay to feel them. Especially in a world where all of our books have perfect endings, the heroine finds the most amazing man, and the problems are always solved. It seems like God continually shows up in fiction, but it can feel like He doesn’t in real life. First, Beloved, let me tell you. It’s okay to wrestle with feelings. It’s okay to wrestle with God over something you struggle over. You won’t break Him. He loves you deeply and more than you will ever know. He sees you as more precious than any other created thing, and doesn’t want for you to struggle. Why? Why does a good God let us struggle, and go through disappointments and much worse? Sometimes, it’s actually because He loves us and is teaching us. Sometimes, it’s because an outcome was necessary for us to end up somewhere where we are needed. Sometimes, we never find out. What can you do to calm your storm? I do a few things. I do a search online for Bible verses that might help me see more clearly or at least comfort me, then I read them and pray about it. I wish I could claim that I know my Bible well enough to rattle off verses that may be of help, but I’m not there yet. I also have a playlist of music that is uplifting, specifically for bringing me back up from a pit. When I’m able, I write out what I feel. I write out what happened, and what course I could take to avoid pain in the future, or what I learned from the experience. If the frustration is minimal and temporary, I am sometimes able to improve my outlook with a little cookie dough. Seriously, there is something in cookie dough that is a little bit healing. 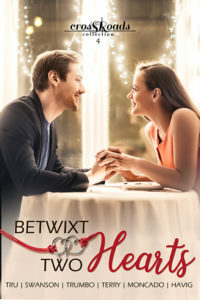 My new book, Whole Latte Love, is part of a new Crossroads Collection, Betwixt Two Hearts. Some of the contributors to this blog are also writers for the collection, so you’ll get to hear even more about it soon. My little story touches on disappointment, feeling unworthy, and not seeing yourself as the Lord made you. You are a precious creation, even if you don’t always feel like one. I’m excited for you to read it. I think you’ll find Drew and Addi’s story touches on being human in world that expects perfection. How do you deal with disappointments? Bless you all, and have a great day. Kari Trumbo is a best-selling author of Christian and sweet romance. She writes historical and contemporary stories with swooney heroes and places that become characters full of detail and heart. She is a stay-at-home mom to four vibrant children. When she isn’t writing, or editing, she home schools her children and pretends to keep up with them. Kari loves reading, listening to contemporary Christian music, singing when no one is listening, and curling up near the wood stove when winter hits. She makes her home in central Minnesota, land of frigid toes and mosquitoes the size of compact cars, with her husband of over twenty years. They have two daughters, two sons, a cat, a bunny, and one hungry wood stove. Kari is most chatty at www.Facebook.com/KariTrumboAuthor/ or you can follow her newsletter to hear about sales and new releases on her website. Giveaway (U.S. residents only)! One randomly chosen commenter to this post will receive 1 print copy of Whole Latte Love by Kari Trumbo. Giveaway is open until 6 p.m. CST February 1st, 2019. Alexa Verde writes uplifting, diverse books about faith, love, and hope. She has had 200 short stories, articles, and poems published in the five languages that she speaks. After traveling the world and living in both hemispheres, she calls a small town in south Texas home. The latter is an inspiration for the fictional setting of her series Rios Azules Christmas and Secrets of Rios Azules. Alexa has a bachelor's degree in Spanish and a master's in Russian. She's worn the hats of reporter, teacher, translator, model (even one day counts! ), caretaker, and secretary, but thinks that the writer's hat suits her the best. Hi Alexa and Kari. Thanks for sharing your thoughts, I immediately thought of Jacob who wrestled with God- the amazing God who made us, allowed Jacob to physically wrestle with Him blows me away! Exactly! I’m so glad you have a way to wade through it, it’s so important. Thank you so much for commenting, Wemble! And so true about Jacob. I also loved your ways to deal with disappointments. Good morning Alexa and Kari! What a lovely way to start the week! Thank you for sharing your thoughts on struggles… I have always been a believer of “there is a reason for everything” but there are times that I have to keep reminding myself!❤️ I do love those times when it may be days, months, weeks or even years later when I can look back and say, oh yeah….that’s why this happened! I love those times too, when you glance back at your journal and remember just what you went through and see where you are now. Those don’t always happen, but when they do, it’s a blessing. I have to remind myself about that, too. :) Thank you for stopping by, Paula Marie! I pray and thank God for our blessings and trust Him to take care of it. Sometimes I have to work my way there though. That is the truth. When I watch friends go through sickness or deal with things that happen and I can’t fathom why… I need things that I can just turn to without thinking that remind me that there is purpose in all of it. Prayer and gratitude are great ways to deal with disappointments. Thank you very much for sharing, Diana! Good morning Alexa and Kari and hopefully you are staying warm! No school in SW Michigan today, so Oma Daycare is closed as well as libraries and more. Unfortunately the worst is yet to come – Wednesday with bone chilling wind chills. Not as bad as the wind chills in January 1982 or January 1985, when I lived in the Windy City of Chicago. When I am disappointed, discouraged, or frustrated, I remind myself WHO is in control. MY all knowing, loving FATHER. Then I take a deep breath, drink coffee and soothe my spirit with chocolate and hazelnut confectionary by Ferrero Rocher. The Crossroads Collections 1, 2, 3, & 4 are inspiring stories. Each collection has a unique common thread. This avid reader has enjoyed all the stories. As an avid coffee drinker, who only occasionally treats herself to a latte, I was delighted with the calorie free indulgence of Whole Latte Love. You are a new author to me. Kari, no need to include me in the giveaway. Best wishes to all the authors of the latest Crossroads Collection. I’m so happy you enjoyed Whole Latte Love! I wish I could say it was easy for me to remember that He is in control and it is for Him that I live, but it is a struggle. When I feel guilt about that, I just read Paul’s writings and how often he had to remind those he was writing to of the same thing. It is an important lesson and one that definitely helps in getting through disappointment. I’m from MN, though we got less snow than they predicted, so we only had 2 hour late starts here. Tuesday through Thursday should be the test here, and I’m not looking forward to it. Renate, thank you so much for all your support! You always have such great comments. Hugs on such cold weather. And I’m so glad you’ve been enjoying Crossroads Collections. I love the unique thread for each collection, too. 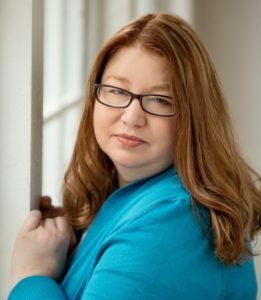 Welcome to Inspy Romance, Kari… and thanks for inviting her, Alexa! The only way I know how to deal with disappointment is to lay my hopes and dreams in front of Jesus, and ask Him to do His will in my life. After I’ve whined and cried a bit, of course. Sigh. Thank you very much, Valerie! It was truly my pleasure to invite Kari. I deal with disappointment by walking and reflecting on God’s goodness. I remind myself that He never changes and He loves me where I am at in my walk with Him. Others may reject me but He never does. So very true! He cares about you and your troubles, and it isn’t news to Him. Hi Lucy Reynolds! So beautifully said. God loves us always. Thank you for commenting! Hi Alexa and Kari! When I am struggling in a season of my life I memorize scripture and listen to uplifting Christian music. . I also sometimes write in a journal. Hi Kerri! Memorizing scriptures, listening to Christian music, and journaling are such great, spritual ways to deal with disappointments. Thank you for sharing! Those are fantastic ways of dealing with the cares of life. What better way to draw the Word to your heart than when you need it most? When I have disappointments I tend to isolate myself and find something positive, like Bible verses,read a good book and maybe a chat with a close friend. Hi, Linda! I love your ways of dealing with disappointments. Thabk you so much for stopping by! Yep…sounds familiar…I’m not a stranger to disappointments..
Praying, letting it go, and trusting! Easier to say than do, but I’m trying! Hello, Natalya! So true, easier to say than do! But we need to try… Thank you for stopping by! That’s a good thing to remember. I don’t think it’s something that’s easy or that we ever really get good at. A pot of tea, a good book & a blanket to curl up with go a long way towards brightening my day. Encouraging Christian music, God’s word and following favorite Christian authors soothe & uplift my spirit. Thanx for the post & the giveaway! Hello Alexa and Kari Thank you for sharing I always Pray and talk to my daughters about some of my life disappointments I know we don’t understand why this happens I know I don’t but everything happens for a reason Thank you for the giveaway! Hello, Sarah! Yes, everything happens for a reason. Thank you so much for commenting, and best wishes in the giveaway! I love Christian romances because I know I can count on that Happily Ever After ending. But the downside is reality doesn’t match up…yet. It’s some comfort to know I’m not the only one to struggle with knowing God can handle my problems, fears and disappointments. Great ways to soothe and uplift our spirit, Jennifer! I loved tha way you put it. Thank you for stopping by and best wishes in the giveaway! Thank you for commenting, Sherri! I wish we could have Happily Ever After in real life all the time. And HEA is one of the reasons I love Christian romances, too.